Ancient lake sediments provide opportunities to reconstruct aquatic ecosystems during previous interglacials. In the summer of 2010, the ICDP project PALEOVAN drilled a complete succession of the lacustrine sedimentary sequence deposited during the last ~600,000 years in Lake Van, eastern Anatolia (Turkey). Previous palaeolimnological analysis of the Lake Van sediment record has shown diatoms to be absent over most of the sequence apart from a short interval during the Holocene. Here, we demonstrate the preservation of additional fragmentary diatom records during Marine Isotope Stage (MIS) 7 (243,000–191,000 years ago; Lisiecki and Raymo in Paleoceanography 20:PA1003, 2005; Jouzel et al. in Science 317:793–796, 2007) and MIS5e (130,000–116,000 years ago; Lisiecki and Raymo 2005; Jouzel et al. 2007), each spanning no more than a few thousand years. Although brief, the presence of contrasting diatom assemblages between these two interglacials provide a snapshot of varying water depth and, by inference, climate. Analysis of MIS7e samples suggests that lake water levels were low after a period when the lake was open (i.e., high lake levels with the presence of an outflow present), resulting in higher salinities and possibly less stable bottom waters, which switched between anoxic and oxic states more frequently. By contrast, the diatom assemblages during MIS5e are characteristic of fresh, relatively nutrient rich waters. This suggests that lake levels were high, that the lake was hydrologically open with an outlet, and that the bottom waters were anoxic for long periods of time. Furthermore, our palaeoconductivity estimates and modelling of the past lake volumes with respect to its salt content support the presence of an outflow. The online version of this article (doi: 10.1007/s10933-017-9973-z) contains supplementary material, which is available to authorized users. Ancient lakes (here defined as lakes that formed before the last Interglacial, more than 130,000 years ago (Mackay et al. 2010), provide unparalleled opportunities to investigate the impact of climate change on aquatic and terrestrial ecosystems over several glacial–interglacial cycles. Until relatively recently, comparatively few long-term Quaternary lacustrine records existed (notable exceptions include lakes Baikal (e.g. Williams et al. 1997), Ioannina (also known as Pamvotis; e.g. Roucoux et al. 2008), and Tenaghi Philippon (e.g. Tzedakis et al. 2006) because retrieval of long sedimentary sequences was logistically complex. In 1996, the International Continental Scientific Drilling Program (ICDP; http://www.icdp-online.org/) was founded to address this knowledge gap, furthering our understanding of the long-term evolution of past climate across the world, including Africa (e.g. lakes Malawi, Bosumtwi, Challa), southern and northeastern Siberia (lakes Baikal and El’gygytgyn, respectively), China (Qinghai), South and Central America (e.g. lakes Titicaca and Petén Itzá, respectively), and in recent years Europe (e.g. Lake Ohrid) and the Middle East (Dead Sea). Key to reconstructing ecosystem functioning in lakes is an understanding of how primary producers have changed in the past, especially with respect to biodiversity and productivity. Diatoms (Bacillariophyceae) represent an important group of primary producers in many lake ecosystems (Smol and Stoermer 2010), that preserve well in sedimentary environments due to their siliceous cell walls. Diatom studies spanning several interglacial–glacial cycles have been published from several ICDP sites including Lake Baikal (Khursevich et al. 2000), Lake Malawi (Stone et al. 2011) and Lake Titicaca (Fritz et al. 2012). Diatom records from Lake Baikal reveal that orbital forcing is a major driver of Quaternary diatom diversity and productivity, while fossil diatoms from Lake Malawi show distinct low-water and high-water phases, again linked to orbital-scale variability over the past 144,000 years. Long diatom records from Lake Titicaca on the other hand, reveal complex responses to climatic and non-climatic drivers over the 370,000 years, including tectonic activity and geomorphic processes (Fritz et al. 2012). Terminal lakes are especially sensitive to climatic change because they are hydrologically dependent on precipitation/evaporation processes (Schindler 2009), which in turn affect the aquatic biota. One of the most recent ICDP sites to be drilled was Lake Van (Turkey; PALEOVAN project; Fig. 1), an ancient, terminal lake located in the climatically sensitive region of eastern Anatolia, between the Mediterranean, Black, and Caspian Seas. The completeness of the 220 m-long drill core from the Ahlat Ridge (Stockhecke et al. 2014a) indicates that Lake Van never dried out, and contains an archive of past climate and environmental change spanning the past 600,000 years. Seismic profiles reveal that for much of the lake’s history, mass-transport deposits dominated the sedimentary record, although elevated regions such as the Ahlat Ridge were unaffected, allowing undisturbed lacustrine sediments to accumulate (Cukur et al. 2014a). Distinct sections (warm/wet periods) of the record are annually laminated (Stockhecke et al. 2014a). Detailed multiproxy analyses of sediment cores extracted in 2010 reveal catchment and within-lake sensitivity to glacial–interglacial cycles. For example, palaeomagnetic values over the past 350,000 years vary with ice core dust fluxes in Antarctica (EPICA; Vigliotti et al. 2014), while pollen analysis reveals high-amplitude climate-driven variability in regional vegetation (Litt et al. 2014). In a detailed lithostratigraphical study, Stockhecke et al. (2014b) were able to separate local factors such as volcanic eruptions and tectonic activity from global climate signals throughout the 600,000-year record, as well as how glacial–interglacial lake-level variations are recorded by the sedimentary processes. Stockhecke et al. (2014b) revealed that diatoms are present in only very restricted sections of the core material, sometimes as thin as 1 cm-thick (‘sapropel-like’ layers). The primary reason is that diatom dissolution is very intense due to the high alkalinity at the sediment–water interface and in the sediment pore waters (Reimer et al. 2009). Diatom assemblages can provide important information on past lake hydrology and salinity (e.g. Fritz et al. 2010) because their remains can be identified to the species level and different species prefer specific environmental conditions. Diatoms can also be used to provide quantitative palaeoclimate reconstructions through the application of transfer functions based on robust relationships between species and their environment (Birks et al. 2010; Juggins 2013). In Lake Van, preserved diatom assemblages are associated with fresh, high lake-level phase, perhaps even an open system (Stockhecke et al. 2014b). A recent lake-level reconstruction based on the modelling of pore water salinity reveals that at the onset of two previous interglacials (MIS7 and MIS5) the presence of an outflow fostered freshwater conditions in Lake Van (Tomonaga et al. 2017). The primary aim of this study is to provide new insight into Lake Van lake-levels during previous interglacials through the application of diatom analysis. We focus our efforts on the previous two interglacials (MIS7e and MIS5e), although several samples from older interglacials (MIS11 and MIS9) were also investigated for comparison. Lake Van is the fourth-largest endorheic lake by volume (607 km3), and the largest soda lake in the world with an area of 3574 km2 and a maximum depth of 450 m (Degens and Kurtmann 1978; Cukur et al. 2015). The lake is located on a high plateau in eastern Anatolia (Turkey), at an altitude of 1648 m above sea level (a.s.l. ; Degens and Kurtmann 1978). Lake Van is a tectonic lake, filling the eastern part of a depression that was closed during the late Pliocene (Stockhecke et al. 2012), likely as a result of volcanic activity from the two nearby volcanos: Nemrut (3050 m a.s.l. ), to the west, and Süphan (4058 m a.s.l.) to the north (Stockhecke et al. 2014a; Sengoer et al. 1986; Litt et al. 2012; see Stockhecke et al. (2012) for a more detailed site description). As a result of Lake Van’s endorheic nature, its hydrochemical regime is sensitive to any changes or fluctuations in the precipitation/evaporation ratio (e.g. climate; Lemcke and Sturm 1997; Litt et al. 2012). Water is only lost through evaporation, which, along with hydrothermal activity, chemical weathering of volcanic rocks, and inputs of felsic tephra, have led to the extreme pH of the lake water (pH ~ 9.6–9.9, salinity 23 g/kg; Degens et al. 1984; Kaden et al. 2010; Reimer et al. 2009; Tomonaga et al. 2012). Although diatoms (and chrysophytes) have been found in Lake Van sediment traps, they form only a minor component (c. 6%; Stockhecke et al. 2012), and are rarely found in bottom sediments (e.g. Stockhecke et al. 2014b). In the summer of 2010, the ICDP PALEOVAN project drilled a complete succession of the lacustrine sediment sequence deposited during the last ~600,000 years in Lake Van (Litt et al. 2012). Sediment cores were retrieved from the Ahlat Ridge (AR, ICDP Site 5034-2) at a sediment depth of 220 m, and in the Northern Basin (NB, ICDP Site 5034-1) at a sediment depth of 140 m (Litt et al. 2012). To ensure a complete sedimentary section was obtained, multiple cores were collected at each site and a composite record for the lake was constructed with 231 sections for AR, and 142 sections for NB (Stockhecke et al. 2014a). Although no diatoms were found in glacial sediments, light microscopic analysis of smear slides (Stockhecke et al. 2014a) and biogenic silica contents (Stockhecke, unpublished), clearly identified intervals to potentially establish a diatom fossil record during the interglacials. The lithostratigraphy confirmed the unique value of the use of Lake Van sediments as natural climate archive covering at least six glacial/interglacial cycles (Stockhecke et al. 2014a). The age model of the complete sedimentary sequence recovered from Lake Van is detailed in Stockhecke et al. (2014b, 2016). The chronology was determined from a variety of dating techniques, including absolute and radiometric dating (varve chronology, radiocarbon dating, and 40Ar/39Ar single-crystal dating), and relative dating (tephrostratigraphy, magnetostratigraphy, 10Be measurements and climatostratigraphic alignment) techniques. The δ18O NGRIP and synthetic Greenland record were used as reference records (Barker et al. 2011; Cheng et al. 2009; Andersen et al. 2004; Rasmussen et al. 2006; Svensson et al. 2008). All data presented use the refined chronology by Stockhecke et al. (2016). Marine Isotope Stage boundaries follow Lisiecki and Raymo (2005) and the nomenclature of the substages follow Jouzel et al. (2007). where n = number of valves in stage S, N = total number of classified valves; Smax = highest stage possible if dissolution of valves reached their end point, where Smax is between 2 and 4. Hill’s N2 diversity was estimated because it is a measure of the importance of very abundant species (Birks et al. 2016), which in Lake Van consisted mainly of planktonic species. As an approximate measure of diatom productivity, mean sample biovolumes (valves µm3/g) were calculated based on diatoms conforming to a series of geometric shapes (Hillebrand et al. 1999), as diatom concentration could not be taken as a measure of productivity due to the effects of dissolution. For a sufficient representation of the average biovolume of a particular taxon, 15 cells from each taxon with >5% in any one sample were measured. The valve depth of centric genera such as Cyclotella and Stephanodiscus was determined as half of the diameter, following Anderson (1994). Palaeoconductivity estimates were undertaken using locally-weighted weighted averaging (LWWA) regression based on the combined salinity training sets (including sites from East and North Africa, the Caspian lowlands, and Spain) available from the European Diatom Database (EDDI; Juggins 2001). Reconstructed conductivity values were generated using ERNIE (v.1.2), a software package within EDDI (Juggins 2001). LWWA reconstructions were undertaken with inverse deshrinking, based on the 50 closest analogs in the combined salinity training set for each fossil sample. Closest analogues were determined by minimum squared Chi squared distance. Jack-knifed prediction error of the model (root mean square error of prediction; RMSEPjack) was 0.47 log10 µS/cm, with an r2 = 0.77. Detrended correspondence analyses (DCA) were initially undertaken on relative abundances of each of MIS7 and MIS5e diatom datasets to establish the magnitude of beta diversity. Relative abundance data were square root transformed in order to stabilize species variance, and rare species were down-weighted. In each case, the axis 1 gradient length (measured in standard deviation units) was under three (Table 1), indicating that linear ordination techniques were appropriate for analyses (Lepš and Šmilauer 2003). Principal component analysis (PCA), with square root transformation of the species data were undertaken on MIS7 and MIS5e datasets. A final DCA was run on a combined dataset of MIS7 and MIS5e samples, but also including samples from MIS11 and MIS9. Ordinations were carried out using CANOCO 4.5 (Lepš and Šmilauer 2003). Importance of the DCA and PCA first ordination axes were tested with a broken stick model (Jollifer 1986) using BSTICK v1.0 (Line and Birks 1996), and each was found to be significant. In terminal lakes such as Lake Van, salinity can be inversely proportional to the volume of the water body (Tomonaga et al. 2014, 2017). To estimate past lake volumes (and the respective levels) from the palaeoconductivities (PC) presented in this work we assumed a linear relation between average conductivity (C = 20.2 ± 4.6 mS/cm) and total dissolved solids (TDS = 22.8 ± 0.6 g/kg) determined in water samples collected from Lake Van in 2006. We used an empirical factor (F = TDS/C = 1.1 ± 0.3 g cm/kg/mS) to convert the PCs into palaeosalinities (PS with PS = PC·F). It should be noted that our first-order estimation of the PSs considers a C value that has been determined using conductivities measured both in the epilimnion and in the hypolimnion, while the rather large uncertainty of C reflects the temperature effect on conductivity. As in Tomonaga et al. (2017), we merged a high-resolution digital elevation model (Farr et al. 2007) and the bathymetry data for the lake (Turkish Office of Navigation, Hydrography and Oceanography 1990) to obtain a complete three-dimensional representation of the lake basin, which we then used to infer the volume of water necessary to produce the variation in dissolved salt concentration (with respect to the present salinity and volume of Lake Van) that would be necessary to yield the estimated PSs. Despite diatoms living in modern Lake Van and their remains being recorded in sediment traps (Stockhecke et al. 2014a), their frustules are almost entirely absent from most of the sedimentary record investigated. Previous studies have also recorded very poor preservation of diatoms in Lake Van sediments. For example, Golubic and Buch (1978) investigated seven cores but only found preserved diatoms in three of these, in sections that they associated with turbidity currents and sediment slumping (i.e. periods of rapid sediment accumulation). Reimer et al. (2009) suggested a narrow period of good diatom preservation between 6.2 and 3.7 ka BP (out of a 15 ka record), was the result of an anoxic, deep-basin brine, concurrent with high lake levels (Wick et al. 2003). We also record short periods of time during previous interglacials (Figs. 2, 3), when diatom concentrations are high enough to obtain quantitative assemblages. A key question therefore relates to the conditions under which diatoms disappear from the sedimentary record. Either they are not growing at all, which seems highly unlikely, or that their frustules are undergoing dissolution, for example in the water column, at the sediment–water interface, or in the pore waters of the sediments themselves. A comparison of the times of occurrence of the peaks in total mass flux in Lake Van at shallow and deep traps (Stockhecke et al. 2012), revealed that the maximum time taken for particles to settle between the two traps (405 m) was ~70 days in 2007 and ~30 days in 2008. This suggests that there could be time for frustules to dissolve in the water column prior to settling, as also indicated by the high Si concentration (Reimer et al. 2009) in the bottom water of the lake. The dissolution of diatoms in sedimentary records is obviously problematic from a palaeoecological perspective–taxonomic identifications become more difficult, poorly silicified taxa may be preferentially dissolved leading to biased records, and if dissolution is especially severe, as in Lake Van, no valves may be preserved at all, limiting palaeoenvironmental reconstructions (Ryves et al. 2008). We acknowledge that dissolution is likely to have had an impact on the quality of finding closest analogues between Lake Van sediment samples and the combined salinity training set (Juggins 2001), and on reconstructed palaeosalinity values themselves (e.g. see Ryves et al. 2006). However, the reconstructions offer a potential snapshot of previous water levels in the lake, even if only for a relatively short period of time. And although absolute values may be uncertain, relative comparison of values between the different marine isotope stages, we believe such analyses interesting and warranted, as long as caveats described are considered. Diatom dissolution has been described in many saline lakes around the world, including the northern Great Plains of North America (Ryves et al. 2006), sub-Saharan Africa (Gasse et al. 2002), and the Bolivan Altiplano (Badaut and Risacher 1983; Fritz et al. 2010). The extent of dissolution depends mainly on the chemical composition of the lake water, i.e. brine type, although high pH can also be important (Fritz et al. 2010). Early experimental work by Barker (1990) showed that maximal dissolution rates and saturation levels occurred in Na2CO3 brines. Dissociation of silicic acid was further enhanced at pH values >9. It is highly likely therefore that diatoms are generally poorly preserved in Lake Van because of the composition of the lake water: it is a soda lake whose chemistry is dominated by Na2CO3, (Degens et al. 1984), its salinity is high (approximately 23 g/kg; Degens et al. 1984; Tomonaga et al. 2012) and the pH of its bottom waters is approx. 9.9 (Reimer et al. 2009). Diatoms in freshwater lakes may also be subject to dissolution, especially where there is intense recycling of organic matter at the sediment surface-water interface, such as Lake Baikal (Ryves et al. 2003). In Baikal, diatoms preserved in lake sediments exhibit bias towards more robust taxa during interglacials (Battarbee et al. 2005), and are very infrequent during glacial periods, possibly because of persistent biological activity at the surface sediment–water interface, when primary production is already low (Mackay 2007). So, the interesting question is why periods in the Lake Van sediment record are occasionally found where diatom preservation is very good. Reductions in diatom dissolution have been observed in meromictic lakes (e.g. Hecky and Kilham 1973; Ryves et al. 2006), especially those that are very saline and have anoxic bottom waters, resulting in a reduction in Si saturation concentrations (Ryves et al. 2006). However, other factors may also help promote diatom preservation in anoxic bottom waters, including reductions in bioturbation and changes in organic matter content. The pore space of Lake Van is known to strongly suppress diffusive transport (Tomonaga et al. 2011, 2014), and might be an intrinsic property of the sediment column hampering secondary biogeochemical processes, which then affects the diatom record. It has been shown that anoxia of bottom waters in Lake Van is promoted by reductions in deep-water renewal linked to increasing freshening of surface waters and stronger stratification during periods of lake-level rise (Kaden et al. 2010). Where we have diatom preservation in Lake Van sediments, TOC is also better preserved (e.g. Figs. 2, 3), indicative of a productive, stratified lake with bottom-water anoxia (Stockhecke et al. 2014a). Overall diatom preservation during MIS7 is poor. Our sampling resolution is very low, but levels containing enough diatoms were mainly found during MIS7e [although one sample during MIS7a at 197.6 ka BP also contained diatoms (Table S1)]. Preservation of diatoms is best between 238.1 and 236.3 ka BP, with a short period of no diatoms preserved between 237.0 and 236.6 ka BP (Fig. 2). The epiphytic diatom Diatoma moniliformis (Kützing) dominates the early record. It is a brackish species that grows well in littoral zones, attached to aquatic macrophytes (e.g. Potapova and Snoeijs 1997). It is likely therefore that Lake Van was relatively shallow at this time. The replacement of this taxon with Cyclotella meneghiniana (Kützing) (a cosmopolitan species commonly found in brackish water; Hecky and Kilham 1973), Cyclotella ocellata Pantocsek, and Nitzschia lacuum Lange-Bertalot, is indicative of alkaline brackish waters (e.g. Kelly et al. 2005), i.e. Lake Van deepened albeit with persistent littoral habitats. As MIS7e progresses, C. meneghiniana gradually increased to almost a monospecific assemblage by 236.5 ka BP, leading to very low Hill’s N2 diversity but high diatom biovolume-inferred productivity and high palaeoconductivity. C. meneghiniana competes well in silica-rich, saline environments, with a maximum growth rate at water temperatures between 23 and 26 °C (Shafik et al. 1997; Kelly et al. 2005; Mitrovic et al. 2010), and is also commonly found in large lakes that fluctuate between brackish and freshwater states (e.g. Hecky and Kilham 1973; Gasse 1986). This suggests that the hydrology of Lake Van may have been quite unstable during MIS7e, leading to the resumption of diatom dissolution when periods of anoxia came to an end (e.g. between 237.0 and 236.6 ka BP; Fig. 2). Declining Hill’s N2 diversity suggests that few resources were limiting in Lake Van during periods of increasing palaeoconductivity (Interlandi and Kilham 2001a, b), although it is not clear if dissolution plays a major role in affecting species diversity, even during periods when preservation is apparently good. Diatoms were only preserved in meaningful numbers for a very short period during MIS5e, c. 127.4–126.4 ka BP (Fig. 3). Before and after this time either diatoms were present at only very low numbers (i.e. under 30 valves present after six transects counted) or were absent altogether. Dissolution is extensive, with greatest DDI values at the lower and upper end of the diatom period, suggesting that dissolution is likely why we have no diatoms before 127.4 and after 126.4 ka BP, rather than no diatom growth. The bottom of the diatom sequence is dominated by C. meneghiniana, indicative again of a hydrologically unstable lake, perhaps alternating between freshwater and brackish conditions (Hecky and Kilham 1973; Houk et al. 2010). Hill’s N2 diversity is relatively high at this time, indicative of a high number of limiting resources (Interlandi and Kilham 2001a, b) allowing several periphytic and planktonic taxa to co-exist. Higher abundances of periphytic diatom species in climate-sensitive lakes are frequently used to infer lower lake levels and concomitant increased benthic habitat availability (e.g. Stager et al. 1997; Gasse et al. 2002; Fritz et al. 2010). In Lake Malawi, Stone et al. (2011) take a more nuanced approach, attributing periods of higher periphytic taxa to periods of fluctuating water levels; that is, more habitats become available when the lake levels are rising and falling. Our assemblage suggests that Lake Van was a relatively shallow (compared to present lake level), brackish-saline lake with extensive littoral habitats during the early stages of MIS5e. If we use the Holocene sediments as an analogy of what may have happened during previous interglacials, we can speculate that high lake levels between 127.4 and 126.4 ka BP resulted in conditions where a fresher lake resulted in better diatom preservation due to bottom-water anoxia (Stockhecke et al. 2014a). When diatom preservation was good, assemblages are dominated by planktonic diatoms characteristic of lakes with relatively stable stratification and reduced turnover. Small Stephanodiscus species such as S. medius and small Cyclotella species such as C. ocellata do not sink very fast out of the photic zone, and have been used as indicators of lakes with reduced windiness and greater stratification (Gasse et al. 2002; Oliva et al. 2008; Winder et al. 2009). Stephanodiscus species generally have low requirement for Si, but high requirements for P (Kilham et al. 1986; Kelly et al. 2005; Cruces et al. 2010). High abundances of Stephanodiscus suggests therefore that during MIS5e, Lake Van was perhaps in a mesotrophic or eutrophic state, linked to a warm, wet climate (e.g. Kukla et al. 2002). Rapidly declining PCA scores between 127.2 and 127.1 ka BP (Fig. 3) reflect the establishment of C. ocellata, a diatom characteristic of mesotrophic waters, which grows well in both planktonic and littoral habitats (Kiss et al. 2012) or when summer stratification is strong (Winder et al. 2009). When it is co-dominant with Stephanodiscus species, conditions were likely favourable for diatom growth with good silica preservation, reflected in increasing Si/K ratios (Fig. 3; Kwiecien et al. 2014). So perhaps here the lake is at its freshest, with lowest pH, and was hydrologically open (Stockhecke et al. 2014a; Tomonaga et al. 2017). At the end of this period, between 126.5 and 126.4 ka BP, C. ocellata dominates the assemblage, with concomitant low N2 values (Fig. 3), indicative of few limiting resources; C. ocellata is a good competitor under nutrient-poor conditions (Winder et al. 2009). Based on the premise that sediment samples with similar floristic composition plot close to each other in ordination space, DCA of all diatoms analysed (Table 1; Fig. 4) reveals diatom composition of the few samples from MIS11 and MIS9 to be distinct from samples counted for MIS7e and MIS5e. The position of diatom species on this biplot represents their maximum abundance in the dataset analysed, such that the further samples are away from the maximum abundance, the less likely that that species is present in those samples. The few samples analysed for MIS11 and MIS9 stages are characterized by very high abundances of Cyclotella choctawhatcheeana Prasad, a diatom characteristic of saline, alkaline, and often highly stratified waters (e.g. Prasad et al. 1990; Oliva et al. 2008), but one which ultimately has wide ecological tolerances. Its dominance may be a result of a period of bottom water anoxia in Lake Van (as suggested by enhanced TOC values and laminated sediment in the intervals from which the samples were collected; Stockhecke et al. 2014a) leading to better diatom preservation. MIS7e is characterized by the brackish C. meneghiniana (Fig. 4), while samples from MIS5e are characterised by freshwater Stephanodiscus species and C. ocellata. Interestingly, the one sample from MIS7a (197.6 ka BP) has a floral assemblage very similar to the MIS5e assemblage, indicative of a freshwater, mesotrophic environment. From right to left therefore, DCA axis 1 captures snapshots of diatom assemblages in successively younger interglacials that suggest Lake Van may have become progressively deeper. This inference is tentatively borne out by palaeoconductivity reconstructions. Palaeoconductivity for the one MIS11 sample was c. 37.8 mS/cm, while MIS9 palaeoconductivity was on average very high (42.0 mS/cm) between 335.0–331.4 ka BP, likely because in the combined diatom training set used to model palaeoconductivity, C. choctawhatcheeana was common in shallow, chloride-dominated waters. Mean palaeoconductivity of Lake Van during MIS7e was 7.8 mS/cm, while that during MIS5e was 1.3 mS/cm. Current conductivity levels in the modern lake water (20.2 ± 4.6 mS/cm) are therefore intermediate in value (Reimer et al. 2009). The conversion of palaeoconductivities into palaeosalinities (PSs; see “Methods” section) results in 37–58 g/kg for MIS11, 33–53 g/kg for MIS9, 8.6 ± 2.0 g/kg for MIS7e, and 1.4 ± 0.3 g/kg for MIS5. Salinity ranges for MIS11 and MIS9 point to lower lake levels compared to the present lake level (see also Cukur et al. 2014b): −83 to −155 m (MIS11) and −63 to −141 m (MIS9). Palaeosalinity values for MIS7 and MIS5e differ significantly from each other and are lower than the modern salinity of about 23 g/kg. These low PSs suggest higher lake levels with respect to the present situation. Tomonaga et al. (2017) inferred an open state of Lake Van during MIS7e and MIS5e based on the modelling of salinity of the pore waters. Our lake-level estimations based on the PSs indicate that this was indeed the case: both PSs lie below 13 g/kg representing the salinity at which the lake would exceed the basin threshold located SW at approximately 1749 m a.s.l. (see the arrow indicating the past outflow of Lake Van in Fig. 1). The contour of the extension of Lake Van during MIS7e and MIS5e is plotted in Fig. 1. It is also worth noting that these Lake Van overflow stages (particularly during MIS5e) coincide with states of a connected Black and Mediterranean Sea (Badertscher et al. 2011). Given the very few samples analysed for MIS11 and MIS9, we only very tentatively suggest that lake levels were much lower compared to the present lake-level, inferred from palaeosalinities of 37–58 g/kg (MIS11) and 33–53 g/kg (MIS9e). The lake level differences between MIS7e and MIS5e may also reflect variability in the pollen record from Lake Van. Although the composition of the vegetation in the watershed during MIS7e was similar to that of MIS5e, total arboreal pollen was less than during MIS5e (Litt et al. 2014) perhaps indicative of the persistence of cooler winters (Roucoux et al. 2008) seen elsewhere in the eastern Mediterranean, e.g. Greece, where temperate forests also dominated MIS7e in contrast to deciduous broad-leaved forests during MIS5e (Roucoux et al. 2008). Further west, along the Iberian Margin, Uk’37-inferred sea-surface temperatures (SSTs) are consistently lower during MIS7e than MIS5e (Martrat et al. 2007). According to a hydroclimate reconstruction (see PC1 in Fig. 5) using a suite of proxy records sensitive to lake level fluctuations of Lake Van, and transient model simulations from an Earth System model LOVECLIM (Goosse et al. 2010), higher SSTs in the North Atlantic correspond to increased precipitation in the eastern Mediterranean (Stockhecke et al. 2016). Our results therefore support the correspondence of climate linkages between the North Atlantic and eastern Mediterranean. Although previous Lake Van palaeolimnological investigations have found diatoms concentrated in Holocene sediments and absent in earlier deposits, this study identifies thin, isolated diatom sequences spanning no more than a few thousand years during earlier interglacial intervals. It is clear that each interglacial is characterised by different diatom assemblage, which appears to be related to prevailing climatic and hydrological conditions. Diatom assemblages in Lake Van during MIS7e were dominated by C. meneghiniana, which suggests that lake water levels were comparatively lower than MIS5e, resulting in higher palaeoconductivity (due to salt accumulation after an open stage) and possibly less stable bottom waters, which switched between anoxic and oxic states more frequently. During MIS5e, diatom assemblages were dominated by small-celled Stephanodiscus and Cyclotella species characteristic of fresh, relatively nutrient rich waters with increased stratification. This suggests that lake levels were high, that the lake was likely open, and that the bottom waters were, for fairly long periods of time, anoxic. Differences in palaeohydrology between MIS7e and MIS5e provide further evidence of close linkages between the North Atlantic and the Eastern Mediterranean during previous interglacials. We thank the PALEOVAN team for support during collection and sharing of data. 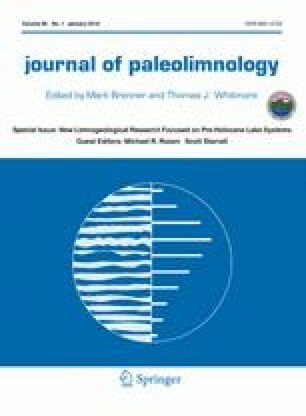 The authors acknowledge funding of the PALEOVAN drilling campaign by the ICDP, the Deutsche Forschungsgemeinschaft (DFG), the Swiss National Science Foundation (SNF), and the Scientific and Technological Research Council of Turkey (Tübitak). This research was also supported by the funding from the EU Seventh Framework Programme for Research and Technological Development (Marie Curie International Outgoing Fellowship to YT, Contract PIOF-GA-2012-332404). Thanks go to A. Feray Meydan, Ismet Meydan, Sefer Örcen, and Mustafa Karabiyikoglu from the Yüzüncü Yıl Üniversitesi of Van, Turkey, for their cooperation.